In this article, the details about post shipment finance credit to exporters is explained. This post also describes about various types of post shipment finance provided by bank with the guidelines of reserve bank. Post shipment credit is extended to exporters by bank with low interest rate till realization of their export proceeds. Post shipment loan helps exporters to get finance without waiting amount of sales from their overseas buyers. What is Post Shipment credit? Post shipment credit means any loan or advance granted or any other credit provided by a bank to an exporter of goods or (and) services from India from the date of extending credit after shipment of goods or (and) rendering of services to the date of realization of export proceeds as per the period of realization prescribed by FED, and includes any loan or advance granted to an exporter, in consideration of, or on the security of any duty drawback allowed by the Government from time to time. Banks serves with low interest rate to exporters under post shipment credit based on the guidelines of Reserve Bank. Since the current instructions of FED, the period prescribed for realization of export proceeds is 12 months from the date of shipment, and if amount has not been realized from overseas buyer within the stipulated period, bank can crystalize such export bills with commercial interest rate. How many types of post shipment credits are there? Export bills purchased or discounted or negotiated. Once after export by completing necessary export formalities, the exporter obtains necessary export documents from various authorities like Carrier of Goods, Customs department and other agencies. The exporter submits Bill of Lading (Airway bill), invoice, packing list, certificate of origin and other necessary export documents with bank. The bank extends post shipment credit by discounting or purchasing of such export bills with a concessional rate of interest. Once after realization of export bills from overseas buyer, the said amount is credited to such post shipment credit. If amount from overseas buyer does not realize within the stipulated period, bank may crystalize such export bills by charging commercial rate of interest. Advances against bills for collection. As explained earlier, if exporter does not want to discount/purchase export bills, obviously he arranges to send export bills for collection. In this case, bank can allot a portion of export bills as advance against bills for collection with concessional rate of interest. Once after realization of export bills from overseas buyer, the said amount is credited to such post shipment credit. If amount from overseas buyer does not realize within the stipulated period, bank may crystalize such export bills by charging commercial rate of interest up to the extend of amount advanced. Advances against duty drawback receivable from Government. As you know, government of each country promotes exporters to earn foreign currency to their country. One of the government supports to exporters is Duty Draw back. Duty draw back is disbursed by customs department after submission of necessary export documents with customs. Bank provides advance against such duty drawback receivable from customs department (government). The exporter submits with his bank necessary export documents on such eligibility on duty drawback. Bank after satisfaction of such eligibility, sanctions advance amount against duty drawback to exporters. However nowadays, customs department disburse duty drawback within least period of time, subjected all documents are in order. 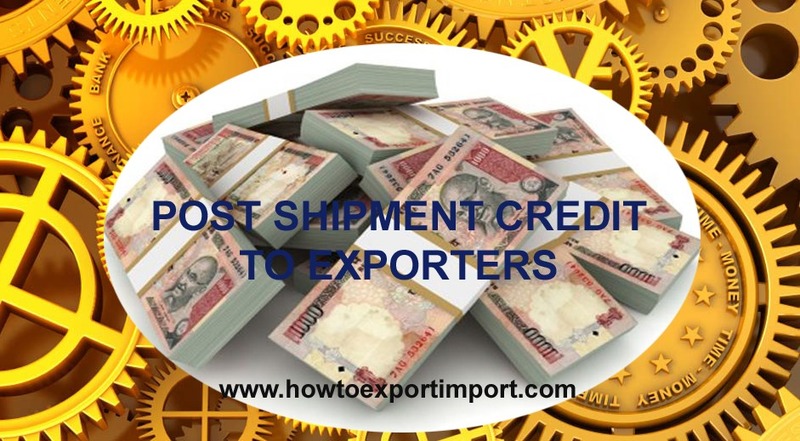 In this article the details of post shipment finance to exporters were explained with various types of post shipment loans to exporters provided by bank. Would you like to add more information about post shipment finance to exporters? 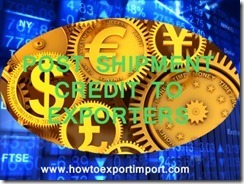 Share below your thoughts about post shipment credit to exporters. Comment below your thoughts about bank post shipment loans to exporters. Sefton Netto: On 15 April 2017 Please clarify, post shipment, i get all export documents and these documents are required for the buyer(importer) to import the goods. In this article you have mentioned that export documents has to be handed over to the bank for Post shipment loan availment. In this case how will my buyer pick up goods without BL, Certificate of Origin etc documents if i surrender the documents to bank. In a case of LC opened for 30 days credit and the shipment reaches in 26 days to buyer, the buyer will require these documents to import. Thank you for your response.